Amazon Total War is a partial conversion for Rome Total war version 1.5 or Barbarian Invasion version 1.6. There are separate versions of the game for each executable. It uses the mod:switch option, so it will not interfere with any of your original game files. Be sure you apply it to a clean install of RTW, as you may experience ctd's when entering battles if not. ATW adds three new Amazon factions to the game: Amazonia, New Amazonia, and the Gorgons. These belong to a new culture, that of the Amazons, with new units, generals, retinue members, and traits just for them. My inspiration for this was the Amazons of legend, and I have tried to keep everything in the mod in the spirit of those legends. So just as legend has it, the Amazons are outstanding archers and horsewomen. They also fight in the standard greek hoplite style, as well as having some troops using the sagaris, an axe that was a signature weapon of the Amazons (and where calling a woman an "old battle-axe" comes from). As the Amazons were not known to be sailors of any repute after the destruction of the Libyan Amazons a thousand years before the mod begins, I have limited them to recruiting biremes and triremes. As the Amazons were reputed to be the progenitors of the Sarmatian people, I have also created a new Sarmatian faction, occupying their ancestral homelands between the Don and Volga rivers. I have tried to emulate their close ties by making Amazonia and Scythia begin the game as Allies. While New Amazonia and the Sarmatians begin as allies as well. I have also made Sarmatian mercenaries recruitable in Amazonia, as well as Amazon mercs recruitable across the steppes. While all Generals are female, the spies, assassins, and diplomats remain male by design. These men would be specially recruited from the Amazons courtesan class of men, or from men in foreign lands. The reason being that in the world outside of Amazonia men can move far more easily through society than women can. Due to the constraints of the game's hard coding, they will all have female names however. But Amazons and are not all that is different in ATW. The original game map has been modified by the inclusion of 29 new territories. Most of them are located in North Africa, the Steppe, and the mountains of Armenia. Scythia has been moved to its more historically accurate starting position in the Crimea and lower Ukraine. It has also undergone a large change in its unit roster, now having many more infantry units of better quality than before. This reflects the effects of their having become partially sedentary at the time the game begins. Every Barbarian faction now has a 4th tier of development. All factions now have a Law temple. There are many new units, including Onagers for all Barbarians. Maiden Axes have been added to Britannia and Gaul. Chosen Slingers added to Britannia, Carthage, and Iberia. Dacia now has Chosen Falxmen. Gaul and Germania have regular Archer Warbands. Mercenary Cretan Archers and Rhodian Slingers are now recruitable by the Hellenic factions from their home islands. Scutarii are now recruitable by Carthage. Elephants and Noble Cavalry have been added to Numidia, Noble Cavalry to Iberian, and Heavy Cavalry have been added to the Greek Cities. Thrace has had a dramatic make-over as well, gaining new units such as Thracian Peltasts, Thracian Infantry, and Thracian Nobles, new temples such as to Sabazios and Kotys, and more. In addition I have tweaked the stats of many units, such as increasing the range and damage of all Slingers, reducing the attack of Warhounds, and increasing the attack and defense of Iberian Infantry and Equites, and increased the defense of Naked Fanatics. Many factions have had their unit recruitment trees altered, with most temple units now being recruitable from a regular barracks instead. The game's corruption triggers have been changed so as not to kick in until your treasury reaches 100,000 and 150,000 denarii respectively. So you do not have to worry as much about making too much money. Every faction has a Legendary Artifact associated with it. Each is unique, and had can only be possessed by a member of its parent faction. These artifacts are represented in the game as retinue members, and give their holders very significant bonuses. If lost through character death there is a random chance they will reappear later in the game. Here is a map of the starting territories. Most of it is the same as in vanilla, just with more territories. The major changes are the Gorgons down at the lower left in Saharan Africa, and the Numidians along the western coast of North Africa. The Greek Cities now hold the new city of Triton on the coast of Lake Tritonis to the south of modern Tunisia, and they have Athens as well, but not Thermon anymore. The Romans are the rulers of Italy, as I wanted them to still be a powerhouse. The Parthians no longer start with Campus Sakae way up on the plains, and instead have a third territory in the middle east. The Seleucids have nearly doubled their territories, but are still in the same general location. Amazonia is located roughly where Pontus used to be, and New Amazonia is way off to north in the forests of modern Russia. Scythia has been confined to the north coast of the Black Sea, and the Sarmatians have the steppe between the Don and Volga rivers. You will notice a great many more territories in North Africa, the Steppe, and the Middle East. I have done this to make those areas more interesting. The normal vanilla game tends to funnel activity in toward the center of the map by leaving only a few territories around the edges. I have tried to reverse this by giving the factions on the map edges more room to play in, and hopefully make their neighborhoods more exciting to play in, rather than being sideshows. As this is an early release there is still work to be done. The general portraits are also only placeholders. Permanent ones will come in a future release. I have disabled the pre-battle speeches of the Amazons, and will also create new ones in a later release, and possibly add strategic map sound effects for Amazon units. Special thanks to SrJamesTyrrel for creating the Amazon Lesser General. Special thanks to Primo for his assistance in creating the early splash screen and loading screens. Special thanks to Private Clark for his work on the New Amazonia Faction skins. Reduced the number of units in the starting Gorgon Horde. Slight increase to starting armies of North African factions. Reduced population bonuses given to AI cities at the beginning of the campaign. Increased stats of Numidian Cavalry. Added Virgin Horse Archers to Scythia. Added Noble Women to Sarmatia. Added a Standard Bearer for the Sarmatians. Made copy-cat Legionaries only recruitable after the Marian Reforms. Made the Gorgons, Germans, Gaul, Scythia, Sarmatia, and Parthia Horde factions, with the Gorgons beginning the game as such. Fixed bug of night battles not working. Created separate versions for the RTW and BI executables. Condensed the code in Export_Descr_Unit.txt and Descr_Model_Battle.txt. New Thracian Late General Bodyguard. Fixed bug with Amazon Companion sword being visible along with lance. Created Hypaspist unit for Macedon, as well as Athenian Marines and Sacred Band for the Greek Cities. Gave the Seleucids two more starting Generals, and also the temple of Zeus. New faction symbols for Macedon and Numidia. Changed shield textures of Greek Armoured Hoplites, Carthaginian Sacred Band, and Macedonian Foot Companions. Made Temple of Woden a Law temple rather than violence one. Added campaign descriptions and starting maps for all factions that were still lacking them. Fixed Sarmatian captain banner in battle odds scroll. Fixed bug with unit's special abilities appearing twice in unit info scroll. Fixed but with wrong factions being able to acquire new Gorgon ancillaries. Fixed possible bug in previous zip file's campaign folders not working. Enabled play with BI executable. Enabled night battles when using RTW executable. Removed city of Nepte, and created new territory of Theneste for the Gorgons. Tweaked Campaign Script and Gorgon starting treasury. Added special building to help AI Gorgons. Added Amazon buildings to the battle map of cities. Major revision to Thrace, removing temple of Ares and adding ones to Kotys, Sabazios, and Bendis. Removed Falxmen from their roster, added Thracian Peltasts, Thracian Infantry, and Thracian Noble Cavalry. Also changed skin and stats of Bastarnae. Renamed Campus Getae to Odessos and moved it closer to the sea. Changed Dacian version of Bendis to mirror the Thracian one (huntress rather than farming). Included several news icons to use with the shorctut. Changed Greek Cities, Macedon, and Seleucid Early General Bodyguard to the Heavy Cavalry skin, and the Late Bodyguard to the Companion skin. The Greek Cities can now recruit Heavy Cavalry. New unit cards for new non-Amazon units. Increased public order bonus of Temples_of_Fun. Added many new territories to Africa, and moved the Saharan ones to be closer to Lake Tritonis. Gave Greek_Cities the settlement of Triton on Lake Tritonis, as well as Athens, while removing Thermon. Also changed their family tree. Moved Numidia to north-west Africa. Added Numidian Noble Cavalry and Numidian Elephants. Tweaked skins of Amazon Hoplite, Amazon Militia Cavalry, Amazon Heavy Cavalry, and Amazon Cavalry. Tweaked skins of Sarmatian Virgin Cavalry, Briton Maiden Axes, Gaul Maiden Axes, and Gaul Archers. Created new permanent skins for all Amazon units. New Spartan Hoplite skin that is still under development. Added some easter eggs. Added Defeat movie for Amazonia. Added Enaree ancillary to Scythia and Sarmatia, and Semnotatoi ancillary to Greek Cities and Macedon. Added territory of Singidunum to Dacia. Fixed over-population issue of steppe settlements. Changed victory conditions for all factions. Added new settlements of Gelonos, Androphagi, and Singidunum. Created pathways though the heavy woods around Neo Themiskyra, and reduced size of Pripet Marshes. Moved Hanging Gardens closer to Seleucia. Replaced most videos for Amazonia, New Amazonia, Gorgons, and Sarmatians. Added sprites for New Amazonian units. Changed name of Carthaginian Chosen Slingers to Poeni Slingers. Tweaked farming levels of Barbarian territories. Tweaked stats of Amazon Archers and Agema Archers. Made Amazon General voices female. Reduced Rome to a single faction. Created two new factions - New Amazonia and the Sarmatians. Added many new regions to the plains and Zagros mountains, and renamed some of the existing ones. Increased the base farming level of many Barbarian settlements. Increased Defense stats of Woad Warriors and Naked Fanatics. Consolidated much of the Amazon texture and model code. Gave a law bonus to academies and stone walls. Fixed a bug where the Night Raider axe was not appearing in melee combat. Removed Roman and Amazon pre-battle speeches. Added 4th tier of construction for the Barbarian culture. Added Onagers to all Barbarian factions at tier 4. Replaced Carthage's Libyan Spearmen with Scutarii. Made Mercenary Balearic Slingers recruitable by Carthage and Iberia in Palma. Improved defense of Iberian Infantry. Made Mercenary Cretan Archers and Mercenary Rhodian Slingers recruitable by the Greek culture in Kydonia and Rhodes respectively. Added Archer Warbands to Gaul and Germania. 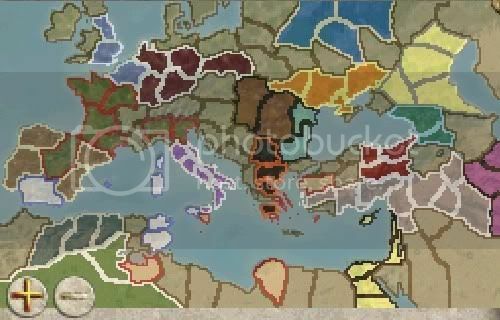 Added Chosen Slingers to Briton, Iberia, and Carthage. Increased range and damage of all Slinger units. Added Maiden Axes to Gaul and Briton, and made their Chosen Swordsmen a more powerful 4th tier unit. Added Chosen Falxmen to Dacia and Thrace. New Amazon Peasant, and many new Amazon unit cards. Changed treasury corruption triggers to 100k & 200k. Fixed CTD when a non-amazon faction clicked on an Amazon city. New .cas and .tga files for the lesser general bodyguard. New temporary Peasant model and skin (previous one was causing CTDs). Added the Data\Fonts folder, as some users were having a crash related to forming the correct font. Trade Caravan building removed from Amazonia. More tweaking of ancillaries, including removing the Amazon Decorated Hero. Fixed bug with eastern heavy cavalry description. Created new model and texture files for amazon heavy cavalry and merc amazon hoplites (they still look the same in-game though). Fixed pop-up text for Command, Influence, and Management attributes. Fixed a few diplomatic messages. Removed the Data\UI\Amazon\Plugins & Data\UI\Amazon\Construction folders as they are not used. Bug with city cards not displaying properly partially fixed. Amazon Generals now have their sword visible. Fixed some grammatical errors in the traits. Renamed region of Pontus to Amazonia. Some minor tweaking of ancillaries. Tweaked some unit stats, removed one of the starting Agema Archers from Amazonia.